We first made this one bowl wonder of a meal while watching the 2012 Olympics. I had just returned whirlwind trip to London to watch the first few days of The Games in person. I was pregnant with baby #1 at the time, so ice cream was in heavy rotation on the meal plan as we watched the rest of the events from home. As I dug my spoon into our shared pint of Stewart's ice cream, eyes fixated on Gaby Douglas’ uneven bars routine, my husband, John, turned to me and said, "Maybe we should be eating tofu or salads." I didn’t put my spoon down until the pint was gone. But the next night I cooked a salad appropriate for watching chiseled Olympians sweat over fractions of points and seconds. To make sure I finished cooking before the first event of the evening, I picked up brown sushi rice from the Whole Foods sushi bar. The seasoned rice adds a hint of sweetness to the salad. As a nod to my sweet tooth, I whisked honey into the lime dressing, hoping to keep myself away from ice cream for the night. Whisk the Braggs Liquid Aminos, lime juice, and honey in a small bowl. Drain tofu and, while keeping the tofu in the container, press as much liquid out of it as you can. Slice the tofu block lengthwise into 3/4” slices, then slice vertically so that you create a grid of 3/4" tofu pieces. 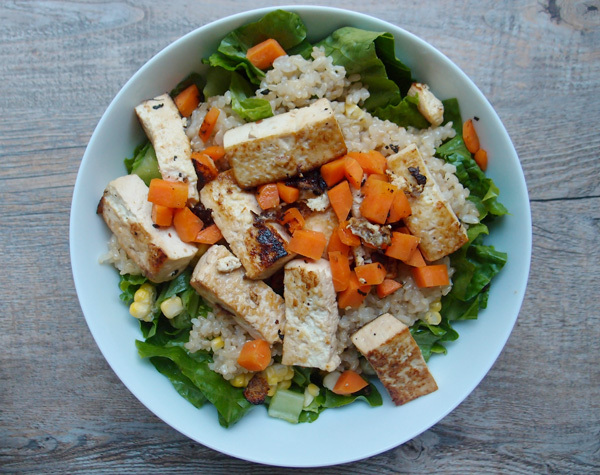 Pour about half of the marinade on top of tofu, reserving the rest of the marinade to dress the salad. Shake the container lightly from side to side to help the marinade drain into the cracks. Let it sit while you chop the carrots and remove the corn kernels from the husk. Remove tofu from the container and arrange in a large nonstick frying pan with 2 teaspoons olive oil. Allow to brown lightly before turning. Keep turning every few minutes until all sides are golden. After a few turns, toss in the carrots and corn and cook until warm, 3 to 5 minutes. Divide the chopped lettuce between two bowls and pour the remaining marinade on top. 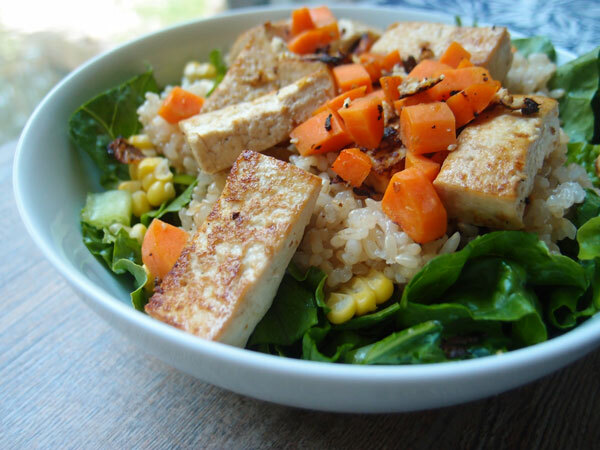 Divide the rice between the bowls, and then add half of the tofu and vegetables to each bowl. Sprinkle with toasted sesame seeds.